#smallstories @lauraritchie @tdorey @clhendricksbc An unlikely spot for teen meltdown: A county fair oxen pull. Slender build, maybe 16, she led, her father behind the team to hook it to the sled. She was struggling -- nervousness, then embarrassment -- to get the team to mind. She swatted, yelled, pushed; the oxen grew more annoyed. Suddenly: "I KNOW, DAD," she yelled. The 3rd time, they pulled the distance. Outside the ring, father, softly: "You have to get them to want to pull." She withdrew. @GeoffreyGevalt @lauraritchie @tdorey @clhendricksbc Such a family moment, right? We&apos;re in fair season here, so this resonated. @clhendricksbc @dogtrax @lauraritchie @tdorey thanks for the response, Christina. A fair number of people in the audience heard it and laughed — a laugh of understanding. 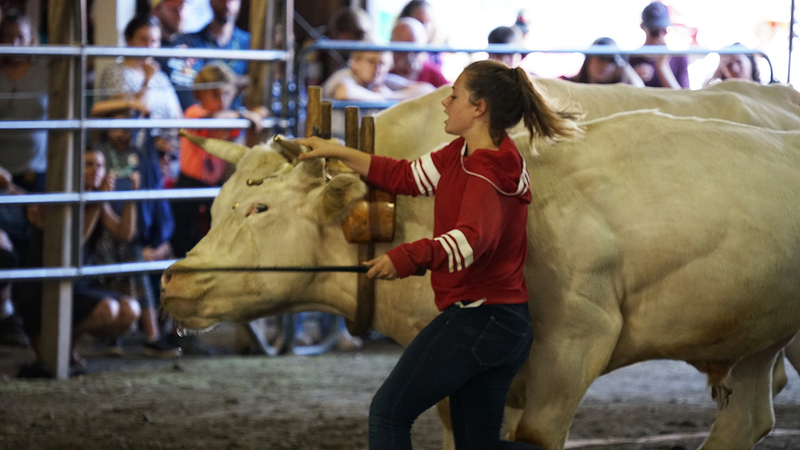 As most are knowledgeable about animals, and the activity of oxen pulling both in the ring and the woods, they knew she was letting her emotions — nervousness — show, which was rattling her team. When she succeeded at her final attempt, the crowd gave her loud supportive cheer.